I know this could have easily been summarised in a Twitter thread, but I needed to add a bit of context to the story. In April 2018, South Africa produced 180 million loaves of bread, down by 6 percent from the previous month (not a major issue, this is roughly in line with the long-term trend). Our bread basket is comprised mainly of brown, white, and whole wheat bread. But, brown and white bread are the most dominant, with a combined share of 98 percent of all commercial pan-baked bread produced in the country. Brown bread commands 50 percent of South Africa’s bread production. White bread makes up 49 percent and the rest is whole wheat and other types of bread. 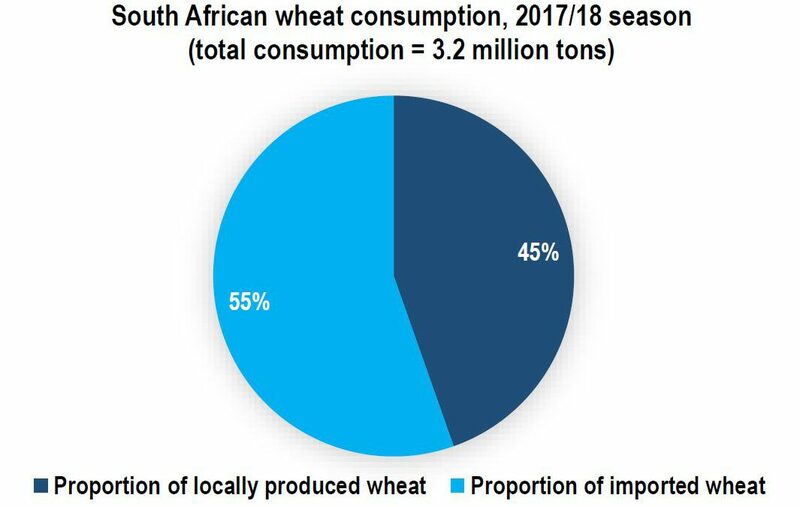 The estimates for the 2017/18 marketing year suggest that South Africa could import more than half of its annual wheat consumption (see featured chart). This marketing year will end in September 2018. So far, the leading supplies are Russia, Lithuania, Argentina, Latvia, Germany, Romania, Ukraine and the United States.